Dramatically speed up and simplify contract creation and management with our contract generator software. What is PandaDoc contract generator software? The PandaDoc contract generator is a simple but powerful online software for designing, sending and tracking contracts. We provide everything you need to build beautiful, functional contracts at scale by adding all the details (including company names, registered address, trade name (the “intellectual property”), etc. ), all from one intuitive dashboard. In the past, it might have taken your sales reps hours to draft a new contract. With our online contract generator, it takes minutes. Who uses contract generator software? The simplicity of our contract generator, combined with its powerful set of features, means that sales enablement can provide sales teams with everything they need from one intuitive software tool. Not only do we provide a range of in-house tools, like eSignature functionality, product catalogs, and contacts, but we also make it easy for sales enablement teams to create and save essential resources, like legal text and client information. 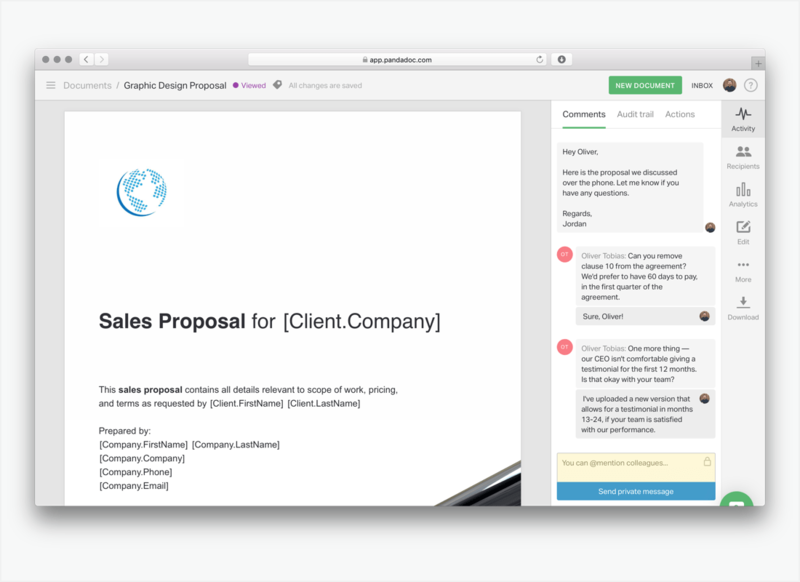 Our contract generator was designed for collaboration and automation across your whole sales operation. Build content libraries, automate workflows, set permissions, communicate with team members, and assign multiple individuals to the same document. It’s all about making the contract generation process quicker and easier, allowing your sales team to focus on closing the deal. Our suite of tools streamlines the process of creating and editing new contracts, legal documents, non-disclosure and confidentiality agreements, etc. Sales reps can quickly utilize essential elements in pre-made content, one-click integrations and a range of templates. With automation and permissions features, review and approval only takes minutes and few clicks. Why PandaDoc contract generator software? The PandaDoc contract creator lets you access custom content libraries, ready-to-go fields like eSignatures, templates, payment integrations and more from one simple dashboard. You can use our pre-made templates or build your own collection of resources. Bring all members of your team together, including managers, sales reps, legal advisers, customer service and clients. Our chat functionality and automatic approval settings make communication a breeze. Automate workflows by setting auto-reminders and requests for approval. Track your team’s activity with document histories and audit trails. One of the contract creator’s most powerful features is the ability to track client actions, from the second they open your proposal to the moment they sign, from a simple dashboard. Our online contract generator software is friendly. We integrate with a number of CRMs and will slot into your existing infrastructure. Upload your existing Word documents, Google Docs and PDF templates and we’ll convert them for use in PandaDoc. We have built a number of dedicated contract management features that also perfectly suit working with freelance contracts. Manage permissions, add branding across contract templates, create access keys and embed eSignatures and much more. Our contract creator integrates with a number of third-party tools. Connect PandaDoc to your CRM, accounting software, cloud storage and more. Our cloud-storage facilities utilize the very latest in security tech. Our data centers are run by Amazon Web Services and we’re SOC Type 1 certified. We have a dedicated security team to ensure your contracts are protected.